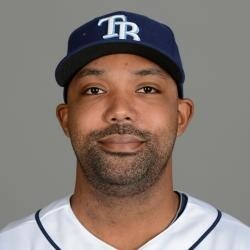 Outfielder Joey Butler is hitting .200 (4-for-20) with one home run in Cactus League play. The 30-year-old needs to step up his game if he is to make the Indians' Opening Day roster. He was a valuable waiver pickup last year, posting a .898 OPS in May and .795 OPS in June before slumping to .482 OPS (July), .440 OPS (Aug) and .222 OPS (Sept). He finished the season on a high by taking both Mark Buehrle and Drew Hutchison deep in his 3-for-4, six-RBI final game for the Rays.